H-town could seriously rock these with his fedora. I'm not opposed to dress shoes, after all. Just dress shoes with no personality. Check out 20 more styles on The Upgrader. But be warned: the prices veer toward horrifying. I think we'll be haunting Wasteland. Me likely. Not as much as I like The Boy's wedding shoes though, they were fabulous. And a big f*** you to the morons who said he wasn't fancy enough. Did they not see the shoes? some one said that about the boy? what the f? damn. the first rule is everything is relative right? that's messed up. guess what shoes we got for my FH??? 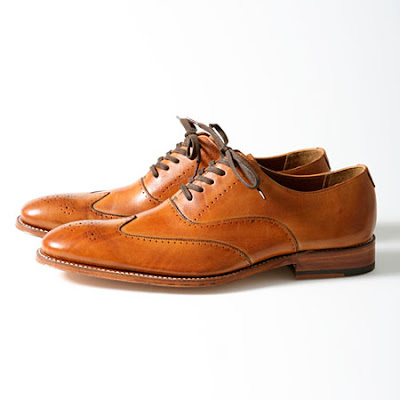 wing tips, baby. they are kind of sharp, right? And we got them on insane sale at bloomies. I have a question... WHY do people post critical comments about other people's weddings? I mean what is the point? Just when I'm feeling the internet love-o-sphere, there's a bunch of f***ers who have to go ruin it.